“Africa” I replied. Thus began the odyssey of a life time. Over the next few weeks we defined the type of trip we wanted to take. We both wanted to learn about the culture of the people but our primary focus would be on the wildlife. We are avid birdwatchers so a chance to see new bird species provide an additional incentive. Next we met with our travel agent and asked her to prepare tour options which would meet our objectives. We choose a 14 day Kenya tour offered by Globus Travel and paid our deposit. Over the next few months we updated our immunizations and applied for Visas. On June 14th, one year after out first conversation, we boarded our flight to London. We planned to over night in London to begin to adjust to the 7 hour time change. The following day we flew the final 8 hour leg to Nairobi, Kenya. Our first two days were based in Nairobi where we met our tour guide and the other ten members of our group. 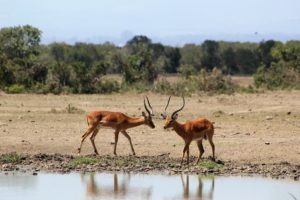 Our first game drive was into Nairobi National Park to visit an orphanage for baby elephants orphaned by poachers, the farm home of Karen Blixen, author of Out of Africa, and a center focused on saving the Rothschild giraffe. Days 3 and 4: Boarding our 8 passenger Land Rovers, we drove about 200 miles of gravel roads to Samburu National Reserve. 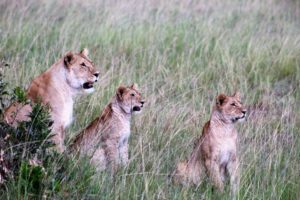 We had hardly entered the reserve when we saw our first elephant and two lions–two of Africa’s “Big 5”. Samburu is very arid but teeming with wildlife. The morning and afternoon game drives yielded close up views of Samburu “Special 5”—Grevy’s zebra, reticulated giraffe, Beisa oryx, Somali ostrich, and the gerenuk, a long necked antelope which feed while standing on its hind legs. Each day ended with sun-downer drinks in the bush while watching the sun set over this stunning landscape. Day 5: Ol-Pejeta Conservancy. Another 150 miles of gravel roads. We checked into our first tent camp. Our tent was pitched on a mahogany wood floor. The queen sized bed, draped with mosquito netting, stood in front of an en suite tiled shower and bath. We enjoyed a glass of wine while elephant, zebra, and impala drifted down to water in the pond 50 yards in front of our tent. While we lingered over a five course dinner, the staff turned down our bed and prepared our quarters for the night. Temperature during the night would drop into the 50’s so the staff warmed our bed with an old fashioned hot water bottle. This wasn’t your typical wall tent hunting camp! On the game drive the next morning we photographed more lions and three white rhinos—our third “Big 5” animal. Day 6 and 7: Today’s drive took us through the Kenyan central high lands, one of the most fertile agricultural areas in all of Africa. Wheat, corn, coffee, and tea grow alongside huge greenhouses where most of Europe’s roses are grown. The drive dropped down into the rift valley to Lake Nakuru National Park. More rhino, impala, waterbuck, baboons, and striped hyena were added to our list. The two track we were driving passed through an area of low bushes along the edge of the lake. Rounding a bend we spotted the massive black bulk of a Cape buffalo 15 yards off the road—the fourth of the “Big 5.” But the main attraction at Lake Nakuru are thousands of flamingos which feed in the algae rich water. Day 8 and 9: Maasai Mara. Yesterday’s drive was mostly on paved roads. Today we drove another 150 miles; the final 50 miles over rutted gravel tracks. When we arrived at the Sarova Mara Camp, we were treated by refreshing cool towels to wipe our dusty faces while the staff carried our bags to our second tent camp. These quarters were as nice as our previous tenting experience. The Mara is a huge flat plain surrounded by highlands. The land is crisscrossed by rivers. It is the northern part of the fabled Serengeti Plain in Tanzania. The afternoon game drive was spectacular. We had barely driven a half mile when we spotted our first group of wildebeest. It was a mixed herd including several hartebeest, with their heart shaped horns, and tan and chestnut colored topi. All three of these antelopes have deep chests, long front legs and short hind legs. This allows them to run long distances to escape their predators. Our driver waited patiently while we photographed these animals but his ear was tuned to the radio. Off we went and soon found several other safari cars gather near some low trees. Cheetahs. For the next half hour we watched the female groom her two cubs. A hard rain shower passed through and we were treated to a double rainbow! But there was another surprise in store. More radio traffic. 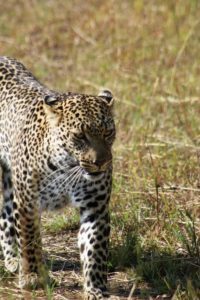 The driver of our other car had located a male leopard—the final member of the “Big 5”. The balance of the day we studied large groups of impalas, Thompson’s and Grant’s gazelles, warthogs, and bands of zebra and wildebeests. There were so many animals it was difficult to focus on any single beast. The sun was setting when we stopped to watch a bachelor group of 20 to 30 impala bucks. My trigger finger got a little itchy; almost any one would be a wall hanger. The next morning’s drive took us along one of the rivers. Huge Nile crocodiles lay on the banks while hippos dozed in the shallows. Turning inland, we watch several groups of common giraffe feeding on the tops of the trees. A short drive along a tree line took us to the dens of several hyenas and two jackals. Our driver’s face broke into a wide grin. “Hang on. More cheetah.” He drove us within 15 yards of three adults laying in the shade of some low trees. They were in shadow so the lighting was poor. “Wait”, he said. “I’ll try to go around.” and he positioned us so that the light fell on their faces! Wow! We climbed up a low ridge ridge and watched long lines of zebra and wildebeest heading down into a small valley. 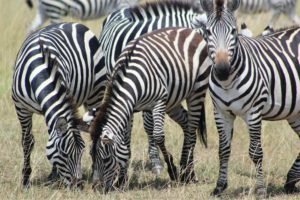 The annul thousand mile migration was bringing the animals down from the plains to the south onto the Mara where recent rains provided better grazing. More lions, gazelles and other plains antelope were all around us. The morning ended with another leopard. This one walked by less than 6 feet from the car. It was so close, my camera wouldn’t focus! The two days on the Maasai Mara were unbelievable! 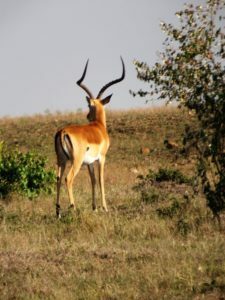 We saw all the plains game from the eland, an antelope as large as our North American elk, to the Kirk’s Dik-Dik, another antelope weighing 15 to 20 lbs. What could top this? Day 10 and 11:Amboseli National Park A 60 minute bush plane flight brought us back to Nairobi where we transferred to another car for the 6 hour drive to Amboseli National Park. The last two hours were over more dusty gravel roads. Along the way we saw several Maasai villages. The men and boys herded their flocks of goats and herds of cattle to water and sparse grazing while the women and girls walk several miles each day carrying fire wood or water. We each had three bottles of water in the car and more at each meal. They have a single meal of bread while we enjoyed fresh veggies and multiple entrees at each meal. 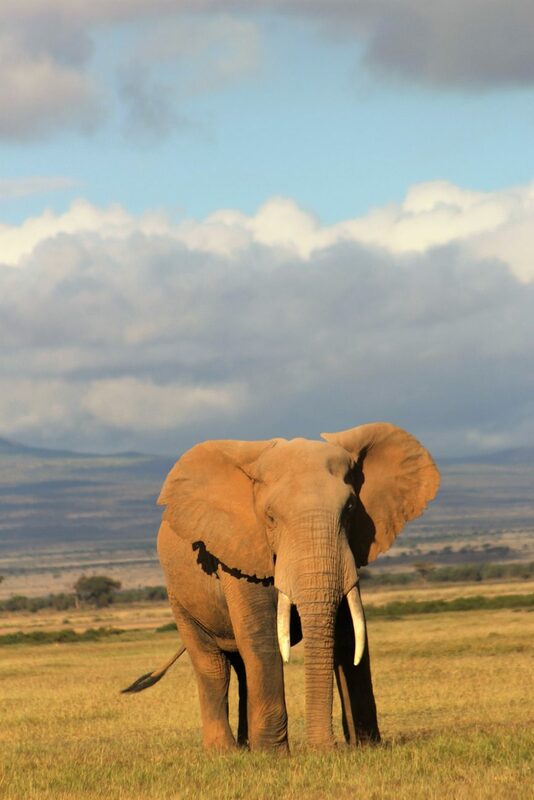 Amboseli is about water and elephants. The park is a plain extending several miles along the Kenya-Tanzania boarder. Mount Kilimanjaro, the highest peak in Africa dominates the sky line. The water from the snow fields on the mountain flow underground to from two huge marshes which attracts Cape buffalo, zebra, and hyenas. But elephants dominate the landscape. The elephant we had seen elsewhere were small in size and numbers compared to Amboseli. Stopping on the drive into the park we counted one herd of 58. There were elephants everywhere! A storm brewing over the mountain crafted a dramatic sky and a fitting close to our adventure. Day 11 and 12: We drove back to Nairobi and boarded the overnight flight back to London. A ten hour layover and another eight hour flight back to Chicago left us exhausted. We stayed over night in Chicago before returning home. 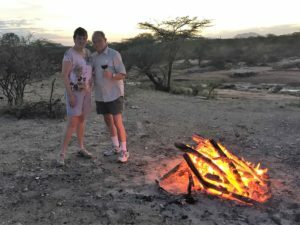 Nancy & Bruce Ter Beek enjoying the amenities of an African Safari! What a trip! New friends, 105 new birds on my life list, and memories which will last a lifetime made this a timeless adventure.